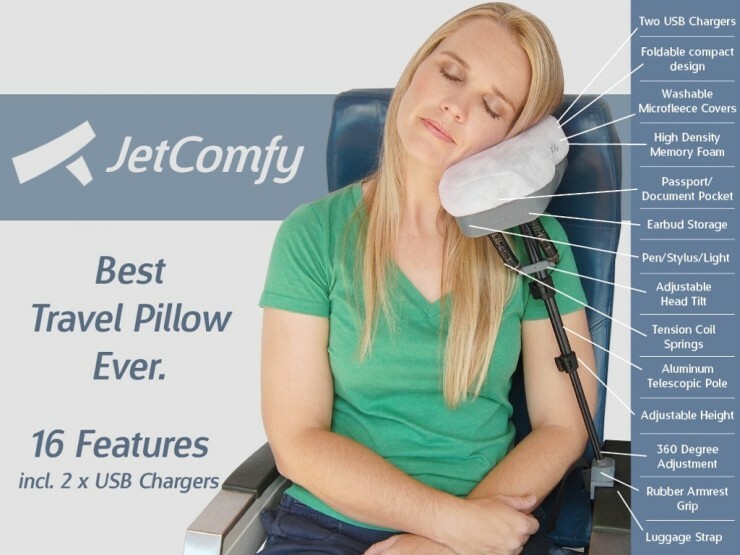 Jetcomfy Might Be The Best Travel Pillow Ever | OhGizmo! The indignities suffered during air travel aren’t limited to the stressful security procedures, nerve wracking customs inspections, or cramped airline seats: getting any amount of sleep on a plane is nearly impossible, especially if you’re stuck in the middle or aisle seat. Regular travel pillows barely help, however the Jetcomfy isn’t a regular travel pillow. It packs a host of features that just might elevate it to the “best travel pillow” status. These include a telescoping rod that allows you to attach it to any armrest, providing your noggin with support in any seat. Additionally, there’s an optional USB power pack for charging your mobile devices, there’s a passport/document holder, there are tension coil springs for your comfort, memory foam for even more comfort, washable micro fleece covers, and a luggage strap for easy transport. The makers have clearly spent a lot of time thinking about what a traveler would need in a pillow, and Jetcomfy seems to deliver. Prices start at $45.